There are many businesses that want to hire armed security guard that has undergone well-planned training programs, keeping this point in mind Secura Security opened "Institute Of Private Security Guards Training" for armed security guard training. Many more dangers are in the job of armed security guards but, if the person is trained under excellent armed security guard training program then, it is sure that any type of situation can be handled easily. 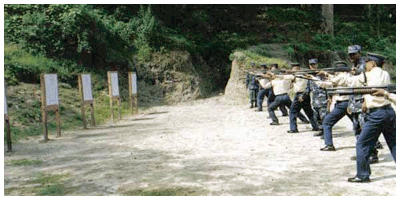 Without basic and advanced training program, no one complete the task of armed security guard. Our security company is one of the well-known organizations in the field of providing personal security guards, female and male security guards, escorts, bouncers, gate security guards along with different types of security articles. Our security company made the training plan under security guard acts announced by Indian government. Under our armed security guard training, we added advanced techniques to handle critical conditions along with provision of basic training to coup with normal issues. So, businesses that want to keep their employees safe along with their valuable assets can contact to Secura Security to hire well-trained, literate, and open-eyed armed security guards.